In a universe where men and women are mortal enemies, Hibiki is captured by a band of female pirates. The group find themselves stranded with a super ship they dub the Nirvana and set out for the female home planet. Along the way, they discover the existence of the "The Harvest" and the possible destruction of both men and women. 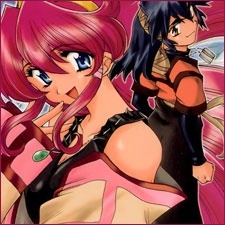 The manga differs greatly from the anime, with fewer characters and focusing more on the relationship between Dita and Hibiki.